Well, I have not traveled the world. Adrian has been to Europe. I have been to Israel. There are not too many places we would visit, even if we could afford the cost and time. But that did not stop us from picking foreign names for this baby. Without realizing the foreignness of our decision, we picked Londyn for a girl and Israel for a boy. I had an ultrasound today (I’m 19 weeks), and we found out which name we were using. It so happens that we are using Israel Arrow Tristan Howell (Arrow after Green Arrow). That evens things up- 5 girls and 5 boys. All the kids were super excited that it was a boy. In fact, we called Hailey at work and Adrian told her it was a girl. Her response? “Oh no! You’re kidding me? I’m SO bummed!” I guess it’s a good thing he was kidding. When I told her it really was Israel she got excited, and also said, “Well, I guess I wouldn’t have minded so much if it was a girl.” LOL. As soon as I got home, I deleted all the newborn girl things I had in my online cart at Gymboree.com and purchased the baby boy items I had waiting in there. The wait for the ultrasound seemed SO long. It was really exciting going into it not having a feeling either way of what it might be, it was a great surprise. Here’s a pic, though not great because the placenta is laying right on top of him (which also explains why I don’t feel him move very often). 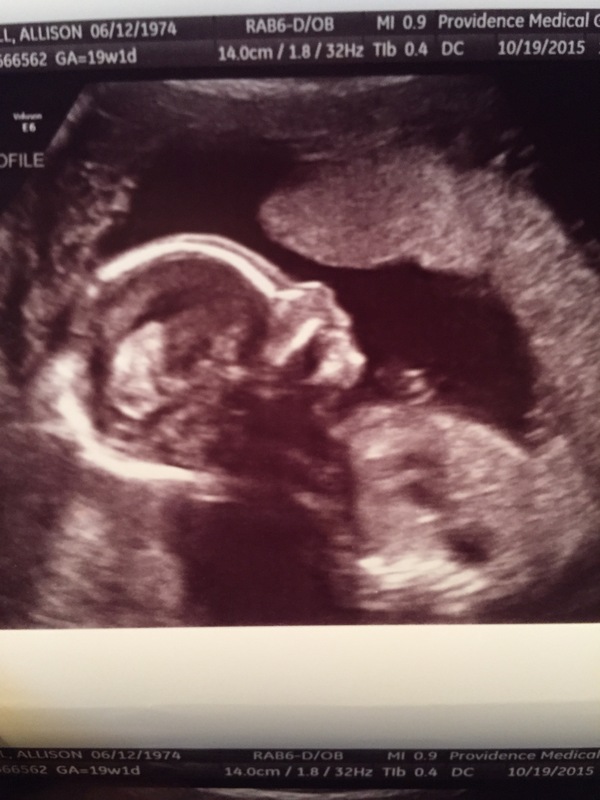 He did continually “chew” throughout the ultrasound, which is just so cute.